But my misfortune did not spare me even at the ashram of Guru Parshurama. Everything was going on normally. 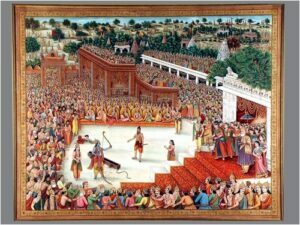 Guru Parshurama was quite happy with my behavior and performance. One afternoon, resting his head on my thigh, he was sleeping under the shade of a banyan tree. In the meanwhile, a black bee came under my thigh on which my guru’s head rested and began to bite. I felt extreme pain but did not move as this would have broken the sleep of my guru. After some time, it began to bleed. The blood oozing out touched the face of my guru. At once he woke up and saw the wound on my thigh. First ,he felt sorry for it. But all of a sudden, his face turned red with anger. Gurudev said ” You are not Kshatriya ! Thus being cursed, I left the hermitage disappointed dismayed and arrived at Hastinapur, the kingdom of the Kaurava Empire. I went straight to Guru Drona’s hermitage to show off my martial learning and skill. When reached there, I saw that there was a great rush and activity. I was informed that the competition of martial art was going on. Kaurav and Pandava princes were displaying their strength, knowledge and skill. I reached the space and occupied my seat among ordinary spectators. A good many valabules you’ve given me. This is both street smart and innteligelt. I not to mention my buddies were studying the great things located on the website while instantly I got an awful feeling I never thanked the blog owner for them. Most of the boys were definitely absolutely thrilled to read them and already have sincerely been making the most of these things. Appreciate your getting well accommodating and also for picking this kind of ideal areas most people are really desperate to know about. My personal sincere apologies for not saying thanks to you sooner.